Time for another Read Aloud Thursday hosted by Amy at Hope is the Word. Earlier in the week we went to the bookstore and we stumbled across two particularly exciting books. We have not read anything else since. 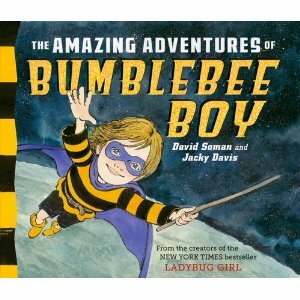 The first is The Amazing Adventures of Bumblebee Boy which is a spin-off from the Ladybug Girl series. (We picked up a few of those titles as well, but I dislike the original book because it shows siblings fighting without a good resolution.) At any rate, Bumblebee Boy is to be highly enjoyed. Bumblebee Boy is having a hard time wanting to include his younger brother in play. "Bumblebee Boy flies alone" is an oft repeated phrase as he goes about trying to slay fire dragons and saber-toothed lions all by his lonesome. However, he "knows is isn't supposed to be mean" so he tries to find polite suggestions to direct his younger brother away from his own personal adventures. In the end though, he realizes that fighting bank robbers and aliens is much more fun with a friend and side-kick. As this follows on the tails of our spending a day learning to be a team, I particularly like the message of the book. My boys, on the other hand, love the fighting, the action, and the loud shouts of, "BA BA BAAH BUUUUM!" that accompany almost every single page. It's very fun. Bookworm1 sits staring at the pages when we are not in the process of reading it because the illustrations by David Soman are quite engaging. Speaking of illustrations, I knew that would one one of the reasons why my boys would enjoy King Jack and the Dragon . 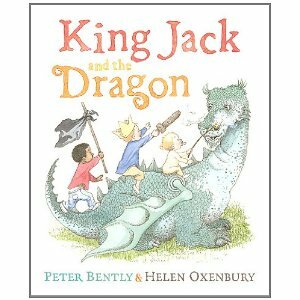 Written by Peter Bently and illustrated by Helen Oxenbury, this book tells us the story of three young boys who built a fort in the yard and spend their day fighting dragons and other creatures. They have grandiose dreams of living in their fort but their bravery (or lack thereof) gets the better of them as day draws to a close and it's time to go in for beds and baths. This is a very cute tale. Despite the fact that there are monsters in this book (a fact which might have the ability to frighten my oldest in particular), the illustrations by Oxenbury make it easy to engage with and enjoy the story. Her drawings are soft and friendly and her monsters not scary at all. Rather, they are just curious looking creatures. Again, Bookworm1 spends a great deal of time with this book spread out before him, examining the pictures. Both of these books have proved to be a huge hit for one reason or another. Mostly because they are exciting and offer a thrill not found in most other picture books which we read. Therefore they are the only two books we have been reading all of this week! These both look like excellent "boy" books! We've read/have several Ladybug Books but not the original. We do like the one where BBBoy is introduced. King Jack looks mighty fun! Haven't read the first one yet, but we LOVE King Jack. We borrowed it from the library and read it over and over, which is really the mark of a fantastic book. I shall add this to my "for the DLM" list! Thank you!